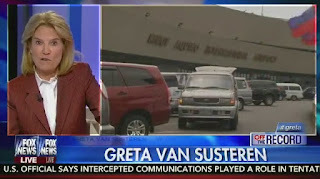 On her nightly program On The Record Wednesday, Fox News host Greta Van Susteren devoted her op-ed segment Off The Record to talk about the laglag-bala scam at the Ninoy Aquino International Airport. Citing a tip she received from a Filipino-American friend of hers, Van Susteren went on to describe the extortion scheme. "There are reports that at the Manila international airport, international travelers, as many as thirty in the last twelve months, five of those in just the last two weeks, are being targeted by Filipino airport security officials who plant live ammunition in their luggage, and then bust the international traveler for having bullets in his bag, even holding some passengers for days telling them they can pay a fine or sit in the slammer facing charges," she said. On her Facebook page, Van Susteren wrote that "The Philippines may get mad at me, but this airport bullet planting scam deserves to be called out!" This isn't the first time that the Fox News host drew international attention with her commentary. Just last year, Van Susteren bravely called out the Thailand government for knowingly sitting on radar information pertaining to missing Malaysia Airlines Flight 370. She later did a follow-up commentary and issued an on-air apology. WATCH: The Philippines may get mad at me, but this airport bullet planting scam deserves to be called out! MNP Poll: Where on TV do you plan to watch Pres. Duterte's 3rd SONA? MNP Poll: Where on TV do you plan to watch President Duterte's 2nd State of the Nation Address? MNP Poll: Where on TV will you be watching the coverage of Duterte's 1st State of the Nation Address?